This is quite worrisome! 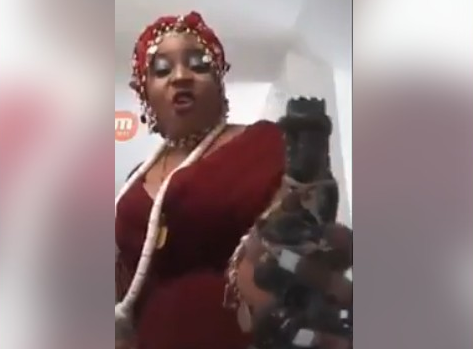 A Nigerian woman based in Spain, has been making the rounds on social media after deciding to go diabolical against her supposed rival/enemy. The woman identified as Laura Ben from Edo state, lashed out on another popular social media influencer from Edo, Monica Ambrose who is based in Netherlands. 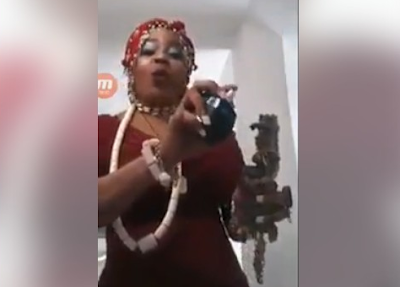 In a video which she posted online and even urged her followers to share, Laura can be seen making some incantations with a traditional artifact which had a small snake, keys and other fetish items on it as she said the snake will swallow Monica and everything she has. Laura who also lit a candle while she continued with her incantations and swearing - said she will deal with Monica seriously. The drama took place on her Facebook page online. Laura said the war is between both of them and she doesn't need to buy plane ticket to meet her (Monica) in her country because she can fight her spiritually. Sigh!